Some days, I have a rich prayer life. Usually follows stupidity. Or, in this case, a long drive home from Saline when all your gas money is in Troy. Thank you! Thank you! 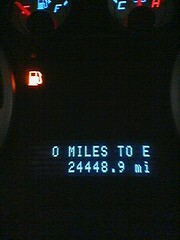 I made it to the gas station! Prayer *is* stronger than espresso!